Take a sunset stroll on the beach in your BB Dakota Sail Away Blue and White Striped Cropped Sweater! 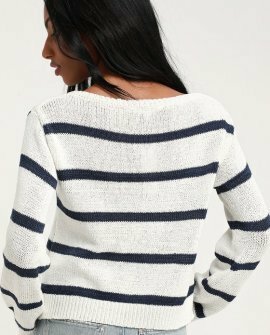 Medium-weight knit, decorated in navy blue stripes, shapes a rounded neckline and relaxed bodice (with ribbed accents throughout). Long sleeves and a slightly cropped hem finish the look.